NOMAD SON "First Light / Pilgrimages of Doom" CD/DVD pre-order. On August 30th, together with NOMAD SON's third album "The Darkening" (as well as STONEGRIFF "Prologus Magicus" CD), we will re-release the band's sold-out debut from 2008, "First Light". It will be out on DVDplus format together with "Pilgrimages of Doom" DVD, and with completely new layout. The DVD contains over 2 hours of pro-filmed and edited exclusive footage from the band's gigs at Hammer of Doom, Doomsday, Headbangers Open Air warm-up and Doom Shall Rise festivals, interview, a song from Maltese TV program and slideshow. We've prepared a trailer for the "Pilgrimages of Doom" DVD that you can watch here. You can listen to the songs from "First Light" album on NOMAD SON page on our website. Check the CD and DVD track listing, high-res covers and more info about "First Light / Pilgrimages of Doom" on the page of this release. 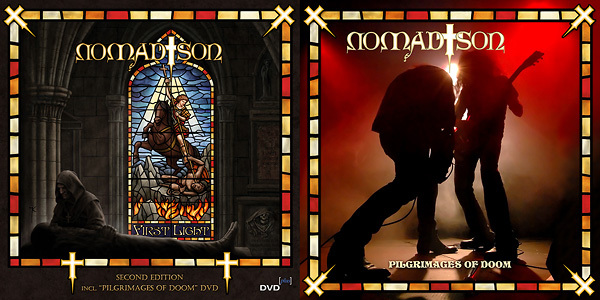 Until August 30th you can pre-order NOMAD SON "First Light / Pilgrimages of Doom" CD/DVD with 2 Euro discount from our SHOP page. It is available also in bundle with NOMAD SON "The Darkening" CD. All pre-orders will be shipped on September 2nd. "First Light" album has been available for download in lossless formats from our Bandcamp page and distributed digitally since years, so you can purchase it also from CD Baby, iTunes, Amazon MP3, eMusic and other retailers. Digital download however DOES NOT include the DVD.